Herzogenaurach is mainly known as the home of the two sports giants Adidas and PUMA. This year PUMA built a bridge named “Puma bridge” in the city in middle franken which has around 23,000 inhabitants. The bridge, consisting of a total of 140 tonnes of steel and glass, which has a length of 85 meters above the Hans-Ort-Ring, now connects the two office buildings of the sports article manufacturer. The project assigned by PUMA was carried out by “Heinrich Lamparter Stahlbau”, a specialist in industrial construction based in Hessen. For the transport of four bridge segments between the “Lamparter” headquarters in Kaufungen and Herzogenaurach, Universal Transport was engaged. With a total length of 45 meters, the realization of the approximately 300-kilometer route required exact and precise planning. 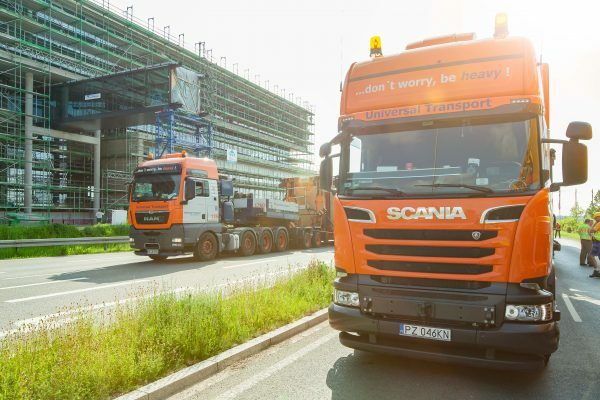 In two-day transports each, Universal Transport moved the four segments from Kassel to Herzogenaurach with so-called adapters ready for the instalment later. In the rainy summer of 2017, but also in the following seasons, the bridge now allows the employees of the sport giant to walk to the different building parts of the offices without getting soaked.